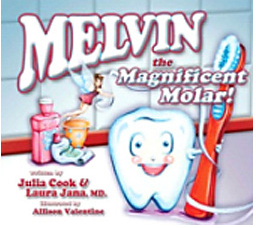 Through Melvin’s view of the world, this book encourages children in a fun-loving, unique way to actually want to brush their teeth. Melvin shows readers how to make sure they will have happy teeth and healthy smiles that will last them a lifetime by promoting brushing, flossing, and regular visits to the dentist! By promoting brushing, flossing, and regular visits to the dentist, Melvin shows readers young and old how to make sure they will have happy teeth and healthy smiles that will last them a lifetime! Written with Julia Cook. "What a fantastic story for children and parents! Melvin provides magnificent and very important tips for establishing healthy teeth habits early and keeping children's smiles cavity-free throughout their lives." "It is critical that children learn as early as possible the importance of taking care of their teeth and gums at home, and look forward to regular visits to their dentist. Melvin the Magnificent Molar provides an engaging introduction for establishing oral health habits to maintain strong, healthy smiles for life."